Have you ever met anyone so specifically trained and employed? Perhaps there are rarer professions. The Australian national rugby union’s specialist number eight coach, maybe? The barber who cuts both Elton Jantjies’ and Kim Jong Un’s hair? 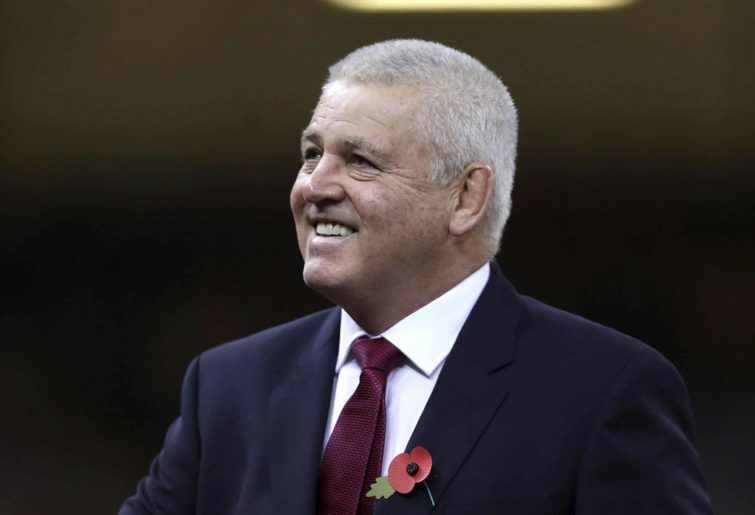 A Kiwi drop goal guru? Pete and I had known each other for an hour, yet we were driving a rented Jeep in blinding summer rain towards Denver. We had happened to be on the same flight turned away from our thunderstruck destination, circling Colorado for an hour or so, and then landing to refuel in Pueblo, where the captain informed us the wait was uncertain. We were not at a real airport. No food was on offer, nor drink, and the doors would remain closed. My new friend Pete and I nodded, grabbed bags, and headed up the aisle as if the pilot was an ordained minister of hasty airline marriages. Never a fan of baking in an enclosed hot metal tube without booze and air flow, full of angry babies and the odour of defeat. I was happy to drop from a makeshift ladder festooned by tumbleweed, to the lonely tarmac, with rangy, rancher-looking Pete. “Most of these folks would go willingly to their own execution. I could tell you were a man who’d take ownership of his own destiny. I’ll not be a slave to slaves,” intoned lean Pete, in a lovely rich baritone drawl, as we strode about a kilometre to a shack beyond a fence at the end of the runway. “Where you from anyway? Australia?” Actually, the scenery of southern Colorado matched what I imagined Australia to resemble: long red rocks, deep defiles longing for water, occasional thorny trees, and low foothills thirsty for the rain coming soon. I nodded slowly, not in assent, but only to be careful with this suddenly dangerous character who imagined us to be in a red-cheeked Hegelian fight against the docility of crowds in the menagerie of post-modern mass travel. This seemed to excite his post-apocalyptic fervour even more, to my chagrin, as he asked if the land seizure stories were true (“That’s Zimbabwe.”), if I could shoot well (“Like Davy Crockett, man!”), and if I knew a professor he corresponded with in Pretoria (I did not). Pete was headed to Wellington, in Colorado. I wondered aloud how many Wellingtons there are, as both New Zealand and South Africa have very nice ones, and that took Pete down a military history rabbit trail involving Foch and Napoleon and Prussians. We called a taxi. No cars are for hire in Pueblo. We split the surprisingly low fare to Colorado Springs, from whence we rented a Cherokee to take us to Denver. I was happy I had not informed the organisers of the Denver speaking event of my travel difficulties, because now, we two rawboned last men of will and self-reliance, had conquered airline and protocol and distance and nature. The topic of my speech was “How I Saved a Gold Mine in Honduras with Just an Ax and Apologies.” It would hardly do for an intrepid fixer who faced down machete-wielding mobs, Central American cartel bosses, and inflamed union protesters, to surrender to flight delays. Periodically, I checked on the progress of our grounded airplane, and gleefully reported to Pete it had never left Pueblo. We stopped at a bar, ate a brisket sandwich, had a beer, and continued on, proud of our small act of defiance. Pete is an expert in the recovery of ferrets. Black-tailed ferrets. Black-tailed ferrets are rare; almost extinct. They fed off prairie dogs, and when the ranchers almost exterminated the prairie dogs, the black hawks and black-tailed ferrets (Pete did not know why both predators were black, which I thought he would know, given his politics) lost the staple of their diet. As we drove in the storm, Pete told me about a genome lab in San Francisco working with cryopreserved sperm, a restoration plan, and then, an upcoming event, which he invited me to attend, when the ferrets would be reintroduced to the prairie. Hundreds of them, loosed from cages and charging out into the spacious West, to recover their lifestyle. Pete was one smart guy, who knew what he knew, and was not waiting around for a miracle. We shook hands (Pete is one of those guys who tries to break your hand) as we pulled up to my hipster artisan hemp boutique hotel in cryopreserved, restored downtown Denver, and he took the Jeep on to Wellington. The doomed flight never took off from Pueblo; but the captive passengers sat without air-conditioning and food for eight hours. The airline bussed them to a hotel at midnight. I can only imagine how cross they were, by then. Meanwhile, clad in a terrycloth robe after a piping hot shower and an IPA, sitting on a balcony, all the better to watch the brilliant lightning show in the black sky, I had the evening to consider my upcoming speech to the gold mine magnates of the world. “Having purchased an ax for $23, as well as flowers and all the meat and tequila in town, my driver-translator-bodyguard and I started to drive up the mountain road. I was too heavy, he said, and had to jog alongside the diesel, until it caught traction on the serrated concrete grade, and I tried to keep the door open as I jumped into the steeply slanted diesel, only to smash my shin, and fall into my chair, with ax and flowers, and laugh-cry with the pain. When we emerged from the clouds, and saw the barricaded mine, it was encircled by chanting workers with machetes, and the language they used to voice their anger was not even Spanish, rendering my Man Friday useless. My leg throbbing, I reached for my tool in the back seat, and walked towards the wall, hoping my odd Viking-ish appearance and long ax would puzzle and part the ribbon of diminutive miners to allow me to climb over and meet the GM. It did. Then I used my ax to gain purchase on the spiraled razor wire atop the wall, scrambled up, and jumped to the grass, spraining the ankle on the leg I’d smashed. ‘Who the f—- are you?’ shouted the besieged GM from the mine office, wondering who this pale lumberjack might be. What the hell does all of this have to do with rugby, and the World Cup later this year in Japan? Pete and the Black-tailed Ferret Recovery Team represents the Home Nations’ bold and heartwarming attempt to recover from their near-extinction in the 2015 World Cup. It probably won’t work, but the work is admirable, and as they slouch towards Brexit, who knows what awaits in 2023? Just like Pete, the Home Nations are decisive and sure of their path to glory. After a de-extinction plan involving all two of Wales’ rugby unions the largest and fastest Welshmen ever born, raised, or imported are housed in cryogenic tubes, their predator instincts heightened as they cross-breed and are fed only the rarest of rarebit, and train in deserted coal mines, tackling cave walls and catching axes with their teeth. “We have forgotten how to let the slaves of slaves score multiple tries on us!” they chant in unison, as they eat only salt after super-cold training sessions in the Tatras Mountains of southern Poland. Josh Navidi does have sort of a black-footed ferret vibe, but will the hawks of New Zealand and the prairie dogs of Australia, the black-footed cougars of the Pampas, and the springing bucks of southern Africa comply in this circle of life plan? Could Wales survive if AWJ steps in a prairie dog hole, or Hadleigh Parkes remembers he is Geoff Parkes’ natural born cousin? You need a lot more than 300 ferrets or Welsh professional rugby players to win a World Cup, because the rate of attrition is so high, and because you must score tries. Each player will have his own individual psychologist, physio, chariot mechanic, and ferret. There will be GPS stats in the loo. No team will arrive with better togs. The expectations will be high. Clearly, this will not work, as the real issue is Owen Farrell is not an inspirational captain and Eddie Jones is a coach who can only handle the opposite of adversity. Sadly, 2019 will be the new 2015: fragile ferrets fail. Ferret out the real strategy of Finn Russell, and you’ll see it as: evolve rugby into something more beautiful and free. Down 7-31, he basically tossed Gregor Townsend’s game plan in the rubbish bin, and started spiralling passes like a Colorado gunslinger in a B movie: he never missed, and every English tackler started looking like a prairie dog ducking a herd of bison rumbling across the cabbage patch. Scotland has introduced a lot of genetic diversity to avoid extinction: Saffa forwards (who miss a lot of tackles), even a Saffa wing (with a very Scottish name), Kiwis galore, and a Queenslander named Sam. But these ferrets are wee, and defend like oatmeal tackles milk. 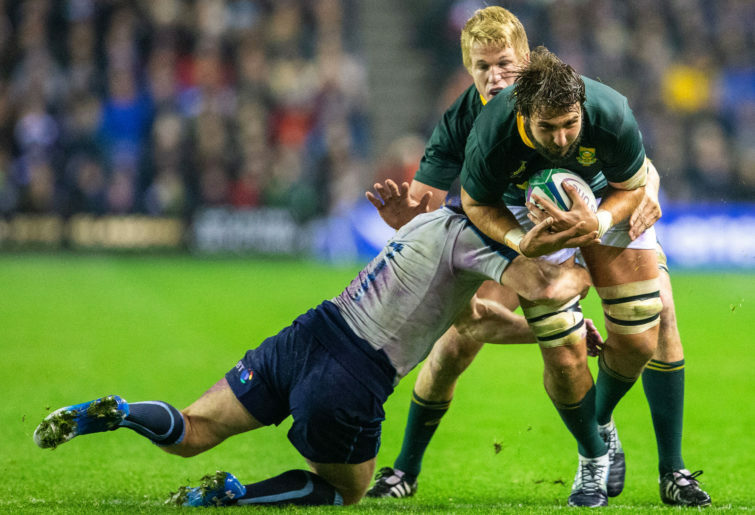 The Boks ran a play against Scotland at Murrayfield. It went like this: Papier to Pollard, Pollard finds that little seam he always does. ffload to Papier (could be Faf, often is Faf). He screams up the pitch 30 metres and offloads to the smiling giant lock from the Bulls, who chicken-wings to the Ginga Ninja, who Sonny Bills a supersonic Shark winger. One recycle and Captain America crashes over. The width of the play was ten metres. The ferrets watched, helplessly. Bison. Big heads. Adorable. A bit stinky. Stay together. Crash. Don’t want to tackle or scrum them. But can they really score? In Japan? On super fast fields? When you’ve figured out a bevy of bison, there’s not much of a Plan B to wonder about. All the biotechnology in the world can’t make CJ Stander, Tadgh Furlong, Jack McGrath, or Jacob Stockdale subtle or quick side-to-side. The southern hemisphere teams won’t have as elaborate a set up in Japan. The Boks’ ‘psychologist’ will also be chief braai-maker, a part-time doctor, beer-carrier, and currency exchange artist. But they’ll show up to the quarter-final against the Scottish general manager or the Irish workers chanting outside the mine, big and mean and carrying an ax and an attitude. ‘Boer maak ‘n plan.’ The simplest tool for the job, and just start doing the job. Faf de Klerk, Handre Pollard, Duane Vermeulen, Eben Etzebeth, Pieter-Steph du Toit, Malcolm Marx, and Steven Kitshoff will not be out-muscled by any opposite number; nor will the flyers in the back be run down or easily kept in front of defences. “Who the hell are you?” will be the question in the opposition’s minds. This isn’t the same Lood or Aphiwe or Willie they saw in November. Argentina are going to tap into their entire diaspora, and don’t be surprised if they go deep into the tournament. They have a wonderful draw. After four years of playing against the fastest rugby teams on the planet, and testing themselves against the best, I don’t think France will scare them. Machetes be damned, the Pumas just land, in jeans and black t-shirts, run up a hill, and start swinging their axes, too. Australia and New Zealand are great travellers. Bumpy ride? Short runway? Tremors in Hokkaido? Hair in the soup? Torrential rain? A debt owed to a gangster after a sumo tourney pick goes wrong? Humid rising sun? A dodgy ref? All of that will just remind them of playing the Lions in Jo’burg in Super Rugby. There are now about 800 ferrets in the world, thanks to Pete and his team. The gold mine in Honduras is churning out nuggets aplenty. From where I sit, with a sharp ax in the shed, and history as my guide, there may only be one Home Nation in the semis, and that’s not certain. Forgive the rambling of an old man; and be assured, my Northern friends, I have only love for you and rugbymen the world over. Let the backchat commence, and long may the spicy hemispheric rivalry survive (even if the Home Nations seem scared to form a league with us).